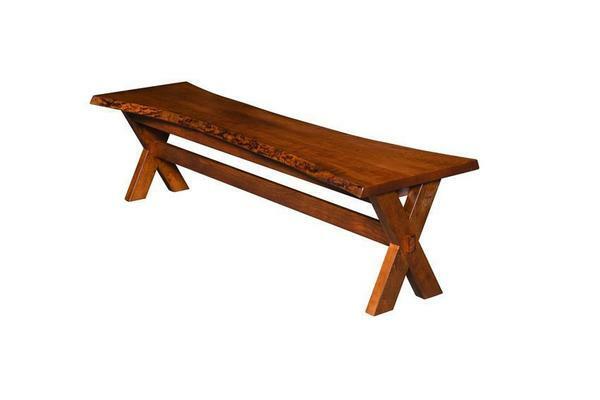 Explore new furniture territory with our Amish Frontier Bench with Live Edge. Each slab of wood is unique, making each bench one of a kind. A piece that will not only start conversations, but last through generations. Furnish your entryway, dining room table, or business office with this piece available in 72", 84", or 96" lengths. Match to our Amish Frontier Table with Live Edge for an unforgettable setting. With 8 wood options and plentiful stains, you're sure to find the unique live edge furniture that fits your space, complements other pieces, and matches your tastes. A trestle base adds extra detail to an expertly handcrafted bench. See finish options for special customizations!